Some of these award-winning cellars chart a steady course of tried-and-true selections. Others are constantly scouting new discoveries. Whatever the approach, these restaurants share a commitment to maintaining stellar wine programs. Washington: A free chart offers an alphabetical list of all Washington wines reviewed for the tasting report in this issue. Portugal Whites: A free chart offers an alphabetical list of all Portugal White wines reviewed for the tasting report in this issue. - Each year, our Restaurant Awards program recognizes the most exciting wine lists around the world. In this issue, we highlight 3,759 restaurants, from 50 states and more than 75 countries, whose passion for wine makes them singular dining destinations for enophiles. Madera - Menlo Park, Calif.
WineSpectator.com: Visit Our Restaurant Awards: Search our online listings and find maps, news and more! 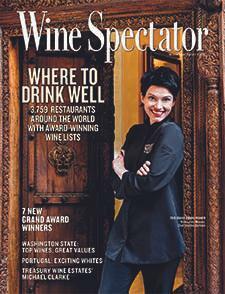 WineSpectator.com: More than 455 wines were reviewed for this report. A free alphabetical list is available. WineSpectator.com members can access complete reviews for all the wines tasted using the online Wine Ratings Search. WineSpectator.com: Bonus Video: What's So Special About The Rocks? : Geologist Kevin Pogue explains the unique terroir of The Rocks District AVA. WineSpectator.com: More than 160 wines were reviewed for this report. A free alphabetical list is available. WineSpectator.com members can access complete reviews for all the wines tasted using the online Wine Ratings Search. WineSpectator.com: Find out more about this intriguing pairing—and get the recipe from chef Amy Brandwein of Centrolina in Washington, D.C. Get it for free and watch a video clip about the pairing. THE WORLD'S BEST WINE LISTS AT YOUR FINGERTIPS Wine Spectator's Restaurant Awards app helps you find restaurants with the world's leading wine lists. Every dining destination in this app—covering all 50 U.S. states and 75+ countries—has earned a Wine Spectator award for its dedication to wine. The app allows you to search through more than 3,700 award winners to find the ultimate wine experience. RESTAURANTS.WINESPECTATOR.COM Have you visited our Restaurant Awards site? Our free online Restaurant Search has been upgraded so you can easily find the 2018 award winners, with maps. Or look for the perfect dining spot in any location by wine strengths, cuisine type, pricing and more. Plus, find all our great dining articles in one convenient location—restaurant guides, sommelier and chef interviews, news and our tributes to our 2018 Grand Award winners. PRIVATE GUIDE TO DINING Our twice-monthly, free email newsletter spotlights the best restaurants for wine lovers, from bucket-list destinations to perfect pizza places. Get great wine picks for dining out, keep on top of drinks trends, learn about new restaurant openings and more. Sign up! SOMMELIER TALKS Meet the people behind the world's great wine lists, get pairing advice and find out which wines excite them most. FOLLOW THE RESTAURANT AWARDS ON SOCIAL MEDIA Keep up with Wine Spectator's Restaurant Awards program on Twitter at @WSRestoAwards and Instagram at @WSRestaurantAwards. WINE SPECTATOR'S 12TH ANNUAL VIDEO CONTEST Share your wine story to compete for great prizes! Submit your shorts to Wine Spectator's annual Video Contest and you could win tickets to our spectacular Wine Experience weekend or a Grand Tasting. Entry deadline is Monday, Aug. 20. Check out the rules and previous years' finalists online. Wine Star: Marilisa Allegrini: The CEO of one of Italy's most revered Amarone houses honors her family's history in the Veneto, with an eye to the future and a tasting of the 2000 La Poja single-vineyard Valpolicella. What's So Special About The Rocks? Geologist Kevin Pogue explains the unique terroir of Washington's The Rocks District AVA. A Perfect Match: Rosemary Lamb With Barbaresco: Find out more about this intriguing pairing— and get the recipe from chef Amy Brandwein of Centrolina in Washington, D.C.
376,000+ WINE REVIEWS Use our powerful online search to find the latest scores and tasting notes, check your cellared wines to keep tabs on their recommended drink windows and latest auction prices, or delve into the historical performance of the world's great collectibles. We've got it all!